Andrew Ng: An Influential leader in artificial intelligence. With the rise of technology, often comes greater concentration of power in smaller number of people's hands, and this creates a greater risk of ever-growing wealth and inequality as well. According to Andrew Ng, with the rise of last few years of technology, a great job has been done in creating wealth in the East and West Coast, but actually, we did leave large parts of the country behind and it would be great if everyone could be bought along. In This podcast, Kevin Scott, the host, who is the Chief Technology Officer of Microsoft welcomes you to Behind The Tech where, they talk with some of the people who made our modern tech world possible and understand what motivated them to create what they did. The host is joined by his colleague Christina Warren, who is a Senior Cloud Developer Advocate At Microsoft. And along with her, the Guest to join in is Andrew Ng, who is one of the preeminent minds in Artificial Intelligence And Machine Learning. So, join in, in this audio clip to learn a little about the history of computing and get a few behind the scenes insights into what is happening today. Talking about the guest of this episode, Andrew is the founder and CEO of Landing.AI, founding lead of the Google Brain Project, the co-founder of Coursera, and has also done so many important things and research on AI and that's not it. Apart from all the credits he holds, he also has an incredible track record as an Academic Researcher. He has a hundred plus really fantastically good papers on a variety of topics of AI. The conversation starts with Andrew's childhood, where he grew up, what actually got him interested in Math and Computer Science and also about his life in academia: All the things he did in order to encourage students to think about if they were considering a career in Computing. Andrew then also explains how basic knowledge of computers and being able to write simple programs in so necessary because today computers hold an important place in our world and coding is the deepest way for people and machines to communicate better and effectively. He further tells us that there is such scarcity of computer programmers today that most computer programmers end up writing software for hundreds of millions of people. But in the future if everyone knows how to code, literacy would not just be better but also very convenient. From here, the conversation then mainly revolves around AI, Machine Learning and the question of the episode, ''Is AI the new Electricity?''. The brilliant quote by Andrew that is spot on. So, Find out what one of the most influential leaders in Artificial Intelligence and deep learning has to say about our future and technology. 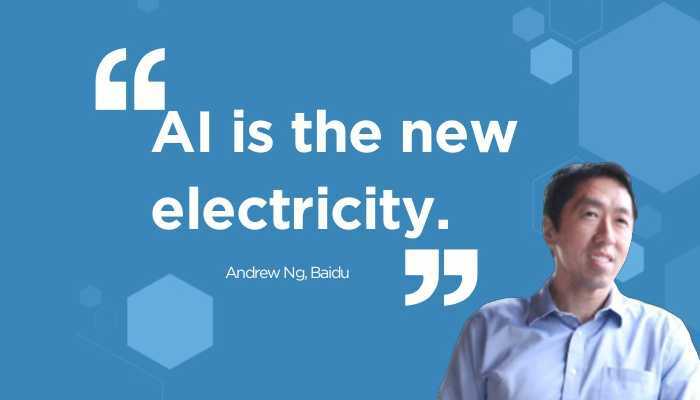 Behind the Tech’s Kevin Scott also talks with Andrew Ng about the Google Brain project, Coursera, Baidu and Ng’s most recent project, deeplearning.ai. Bringing out a conversation like never before. Summing up, This is definitely one episode that you'd not want to miss!